While one project cures in investment for casting tomorrow, I’ll show you something new. I got a new texturing hammer for Valentine’s Day (yes, he truly knows what I want) and put it to work on brass. I cast some copper trinkets and ended up with earrings! These are coated with a metal lacquer so the color shouldn’t change from this. 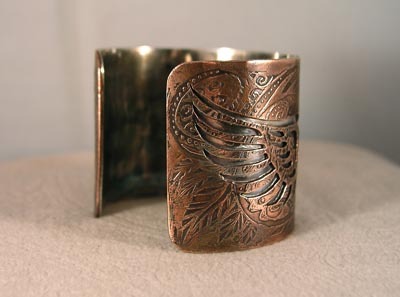 I also made some straight copper bracelets. 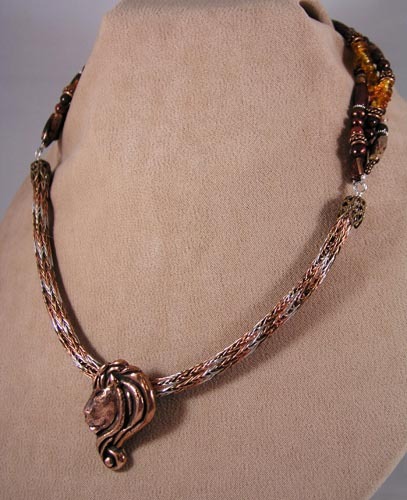 I appear to be outnumbered by folks who *can* wear copper without a sterling or leather barrier, so this is for you. 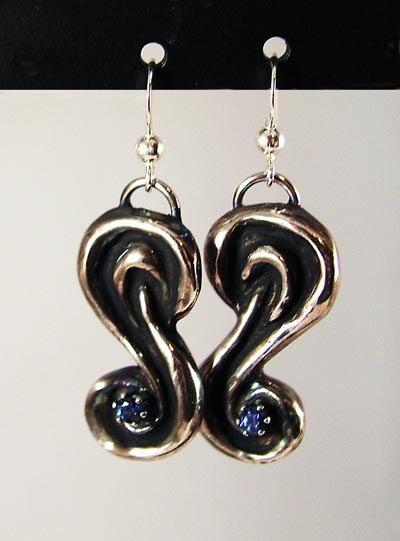 Like the earrings, though, there’s a thin coating of metal lacquer on them so the color will stay true, and someone with allergies should still be able to enjoy it. I haven’t given it a long test, though, so I can’t say if the lacquer will wear off eventually. 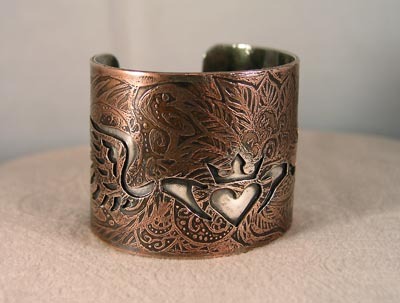 The first one is etched with a winged claddagh and is 1″ wide. The second one with the sculpted keyhole frame on an etched background is 1-1/2″ wide. It’s still one of my favorites and I wear mine a lot. 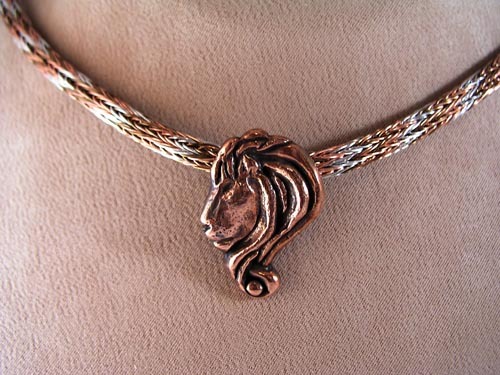 However, it’s a fairly expensive piece to make since the silver provides the structure, and silver prices keep going up (but I’ll happily make one special for you if you like it). So I thought, what if the copper does all the heavy lifting? 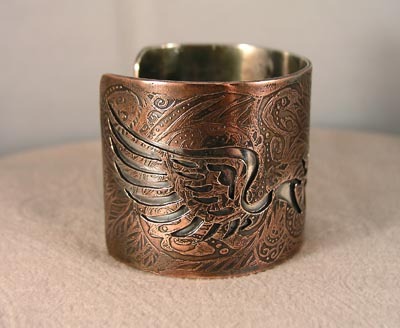 Can I solder a much thinner sheet of silver to the copper as a liner and pierce the copper to show it from the front? 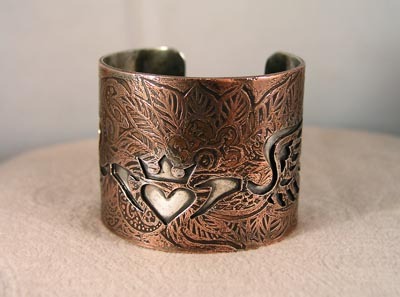 That’s indeed what this is, with the copper sheet freehand doodled and etched and a winged claddagh cut out (four saw blades later). Comments? Suggestions? I probably won’t make too many of these since my time investment is fairly high, but I’m very happy with how it turned out. 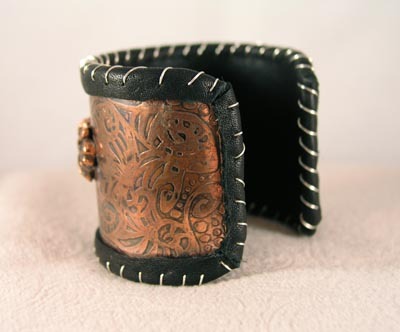 Here it is, the two-inch wide copper cuff. This thing is so badass it’ll win your arguments with the mere suggestion of being backhanded. It started innocuously enough as a strip of sheet metal. 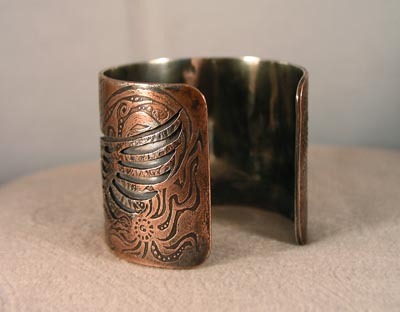 I freehanded the swirly background and etched it. 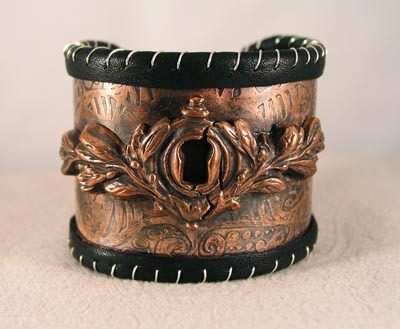 The keyhole centerpiece was carved from copper clay and added to the sheet after it was drilled out and pounded into shape. 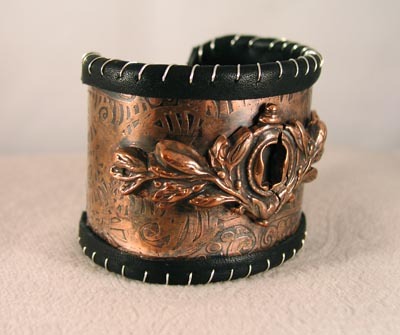 I can’t wear base metals, so I attached the leather backing and wrapped the sides of the sheet with it so the copper wouldn’t come into contact with skin. 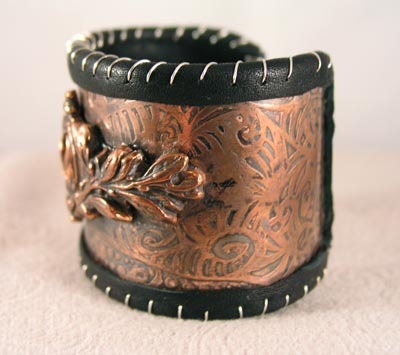 Finally, I stitched the edges of the sheet and the leather with sterling wire. It’s more decorative than structural, but I wanted a little silver flash and contrast. What do you think? Would you wear something like this? Edit: Already such great suggestions! On the next one, the leather edge will be pared down and folded under, the silver wire will be thicker, and I’ll etch the pattern deeper. 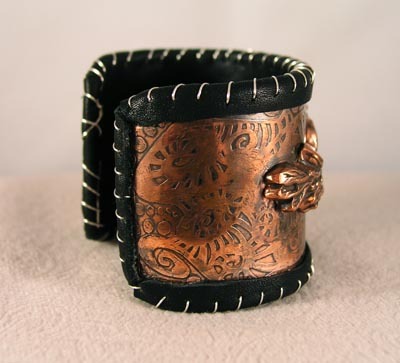 I’ll see what it looks like with brown leather, too. Trial and error and new bladed tools, hooray! If you haven’t heard, the price of silver keeps climbing. 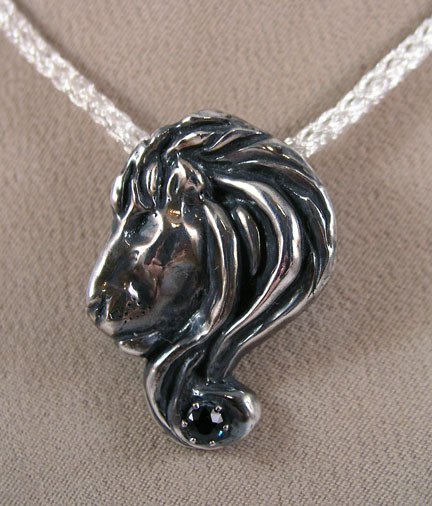 I’m thinking of casting pewter (lead free, of course) as an alternative. I’ve worn it and it doesn’t react to acidic me, but what about you? 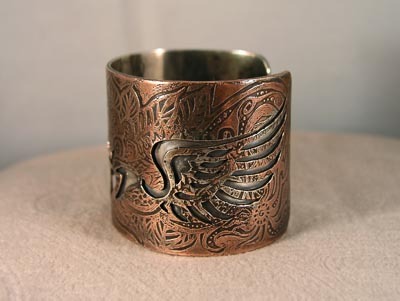 Have you worn pewter? I’ll still be working in silver, but this may make work more easily accessible to all budgets. 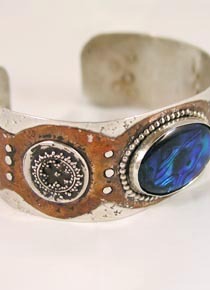 I was at the Scottish Highland Games this past weekend and noted that browsers seemed to be attracted to price point as much as anything else, and silver plate seemed to be selling quite well, so the heirloom quality of a precious metal piece of jewelry was perhaps not so much a factor in decision to take a trinket home. The experiments may well begin here. 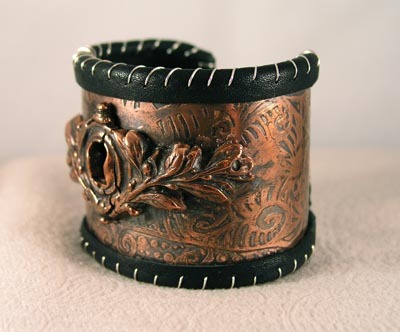 I’m thinking 2″ to 3″ wide copper cuffs, etched, soldered filigree wire work, riveted objects, drilled holes, stitched with silver and lined with leather to protect reactive skin. They’re going to be fabulous.